So.. what do 你 think ? I mean it kinda does but I see what your saying. The 紧身胸衣 needed 更多 details, like the rectangular ice shard mosaic. Actually OUAT isn't from Disney, it's ABC I believe. Yeah, they fucked up on a lot of things. Just look at Kristoff. Omg, lol. Oh, he "cut his hair" (that's how they get away with it). No, he didn't. The actor just didn't have his hair grown out. the dress looks nothing like it in ouat 由 the way there was snowflakes on the dress not beads. 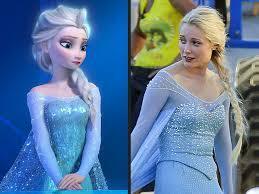 I think that Elsa ice dress is amazing! !